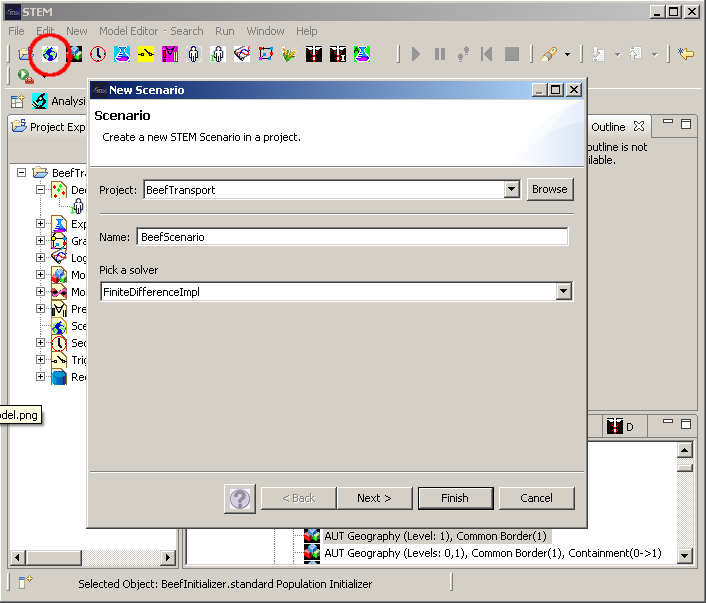 Difference between revisions of "STEM Import Discrete Transportation Events"
The trigger was automatically created during the Pajek-Import step. It contains the time dependent migration rates. 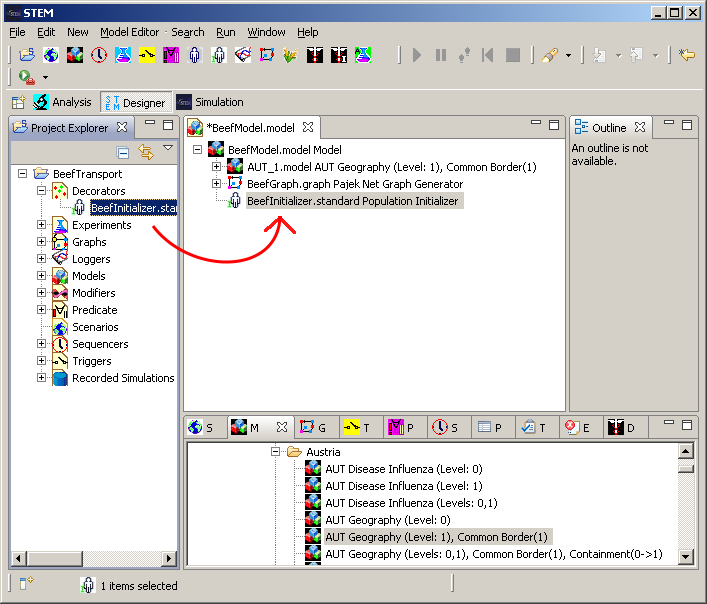 In STEM there has to be a population model for each population. We just set the birth and death rates to zero. We have finished creating the Scenario. Now we can start the Simulation. 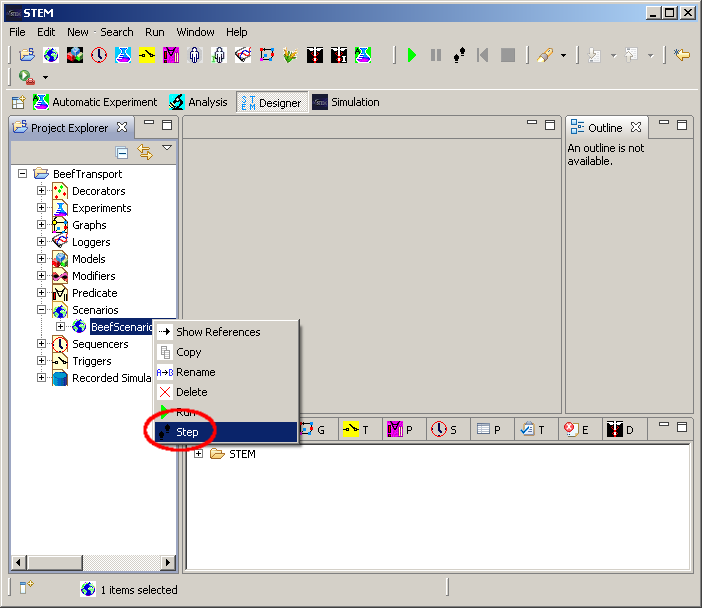 Press the '''step''' button to perform the initial step. We have finished creating the Scenario. Now we can start the Simulation. 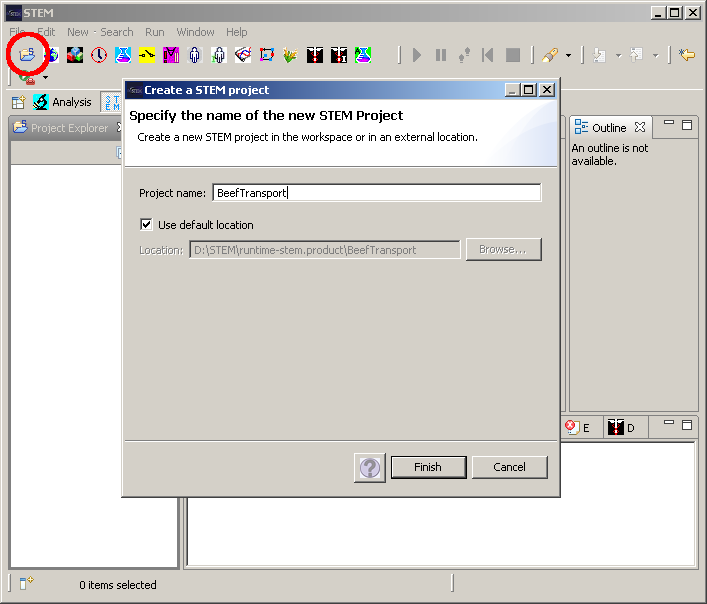 We press the '''step''' button to perform the initial step. The Trigger has to be selected in the upper left combo box. Thereby regions regions are colored based on the number of beef units already transported to the regions. If you select '''Migration (Triggered)''' in the '''Edges''' combo box, all migration migration edges with rates >0 at the current date are shown. We need to select the Trigger using the upper left combo box. This colors regions based on the number of beef units already transported to the regions. If we select '''Migration (Triggered)''' in the '''Edges''' combo box, all migration edges with rates >0 at the current date are shown. 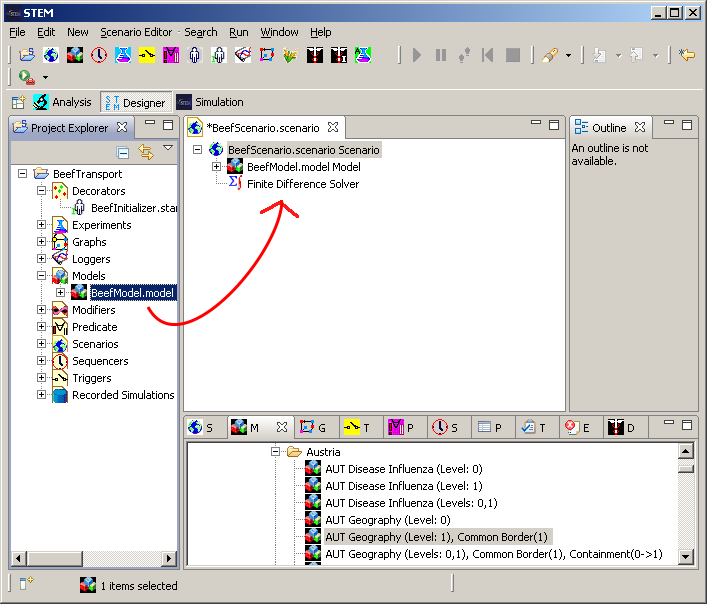 This tutorial shows how to import the discrete transporation events from a Pajek file and visualize the events. 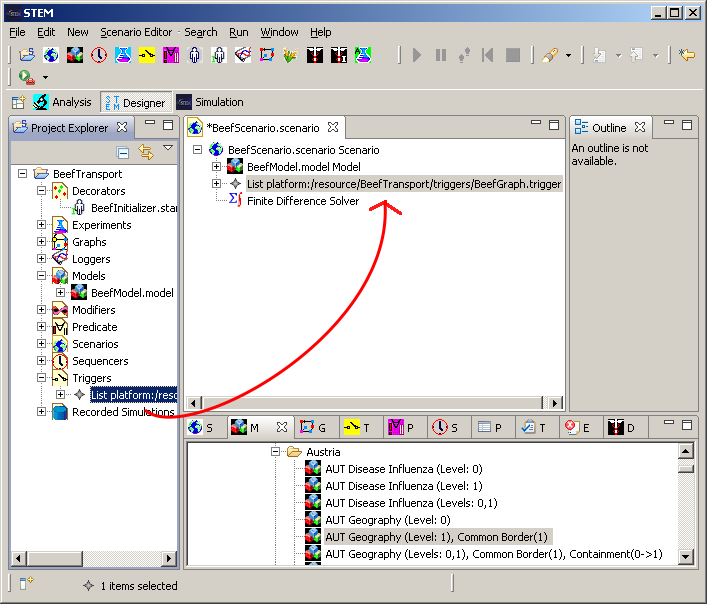 Documentation on the Pajek format is available at Importing a Pajek Graph. 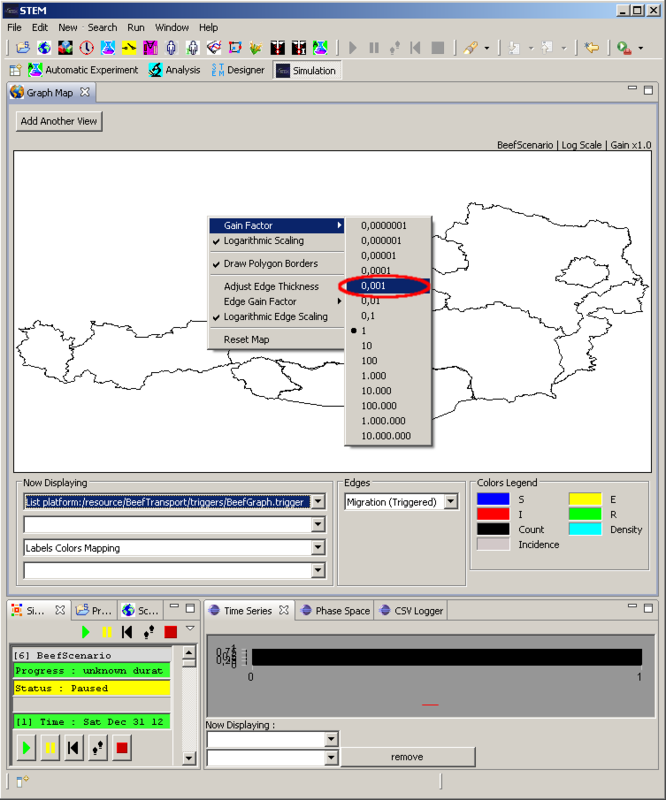 The import of transportation data of beef for Austria is used as an example here. The following text must be copied into a new textfile named graph.net. 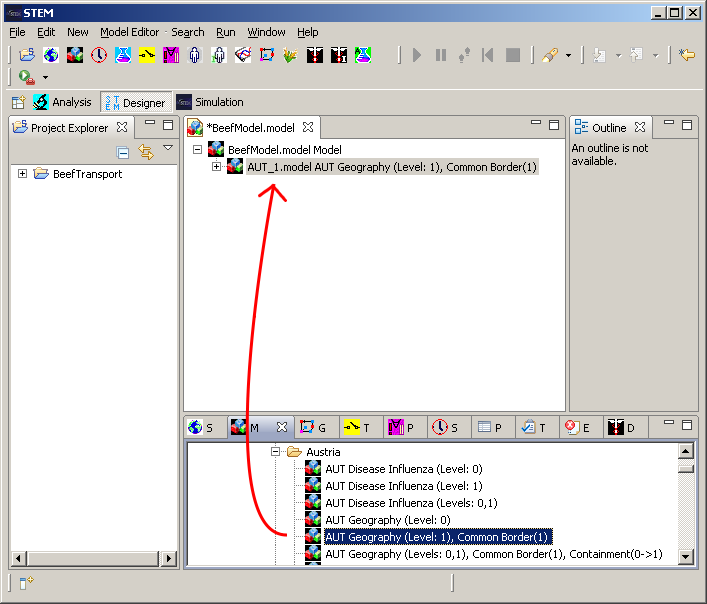 In the Vertices* section node references are specified for AT-2, AT-3, ... AT-10. 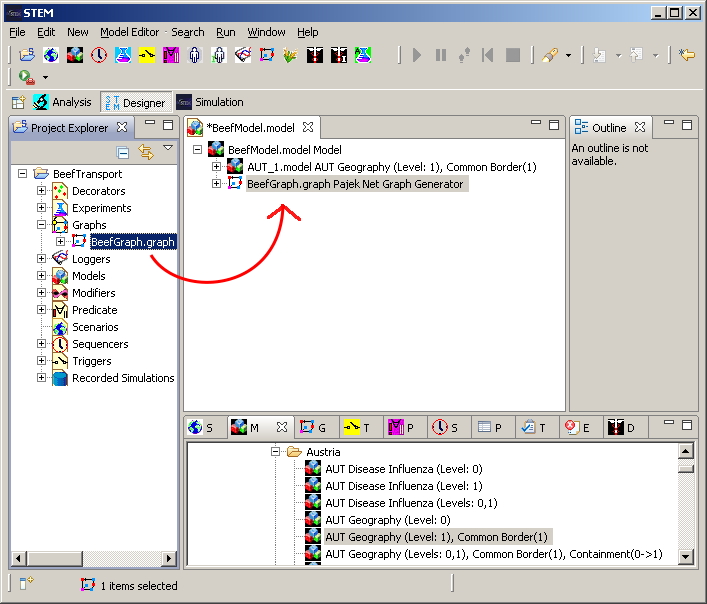 These are nodes from the STEM library graph of Austria. 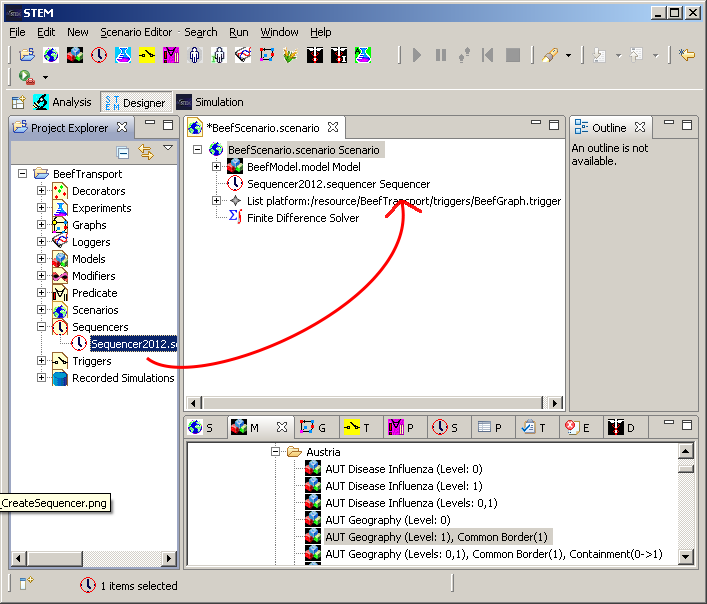 In the Edges* section migration edges between these nodes are defined. 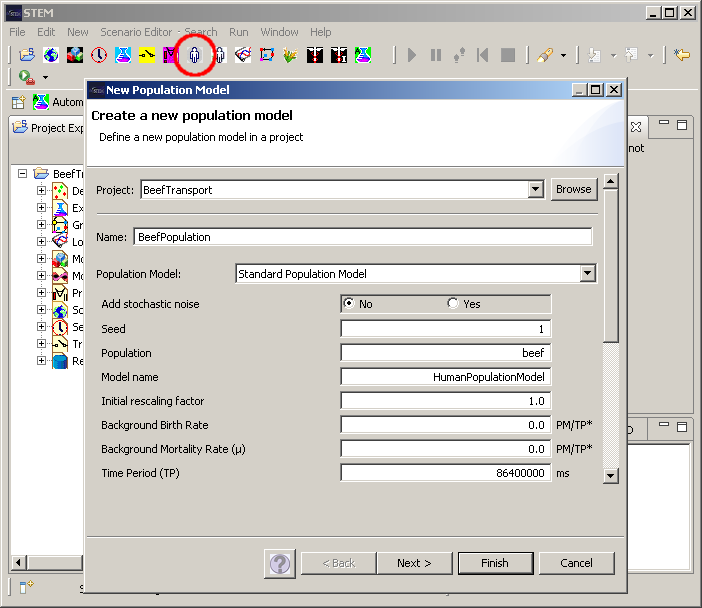 The edges have default migration rate of zero and a rate >0 for a specified date. That means on this particular date beef moves from one region to another. 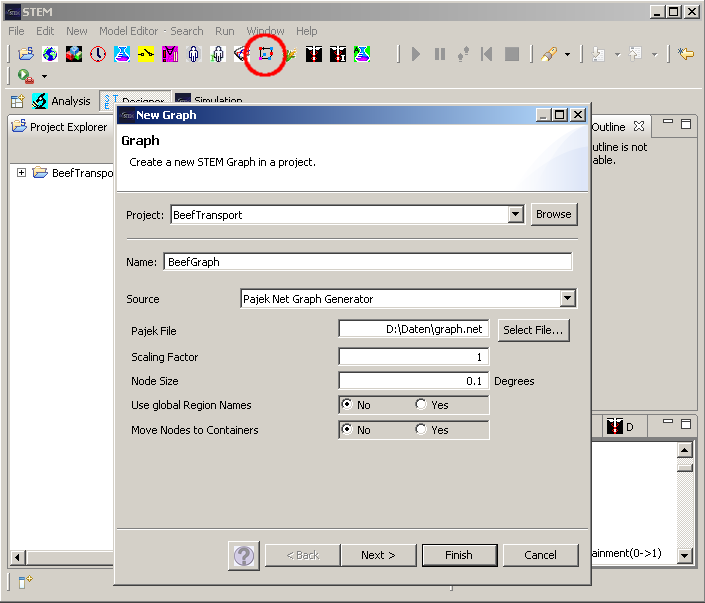 This model is created as a container for all graphs used in this tutorial. The Pajek file must contain the text from The Pajek File. 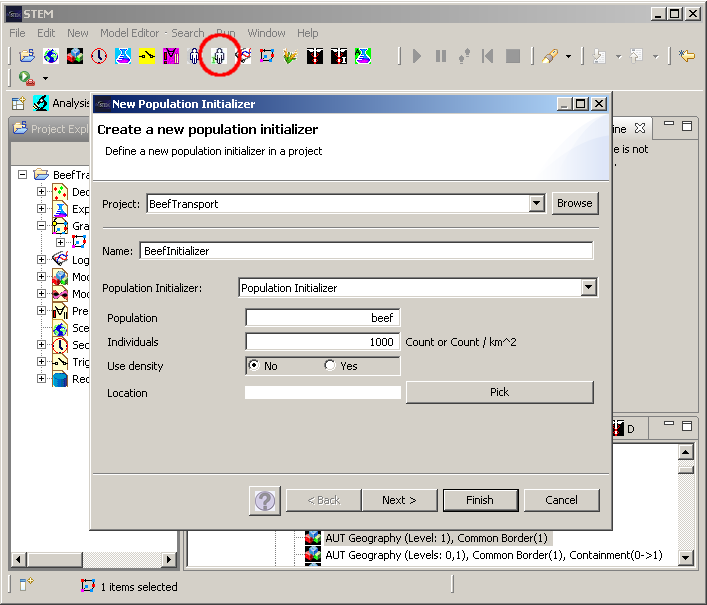 The population initializer is needed for initializing the regions from the Austria with the population beef. Each region is initialized with 1000 units of beef. 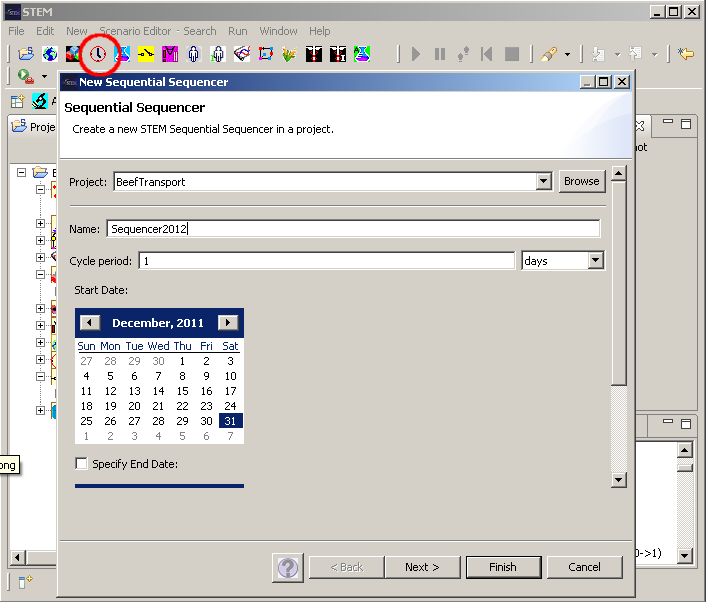 Since the dates in the Pajek file are the first 8 days of 2012, our Sequencer will start on December 31st 2011. We have finished creating the Scenario. Now we can start the Simulation. We press the step button to perform the initial step. We need to select the Trigger using the upper left combo box. This colors regions based on the number of beef units already transported to the regions. If we select Migration (Triggered) in the Edges combo box, all migration edges with rates >0 at the current date are shown. 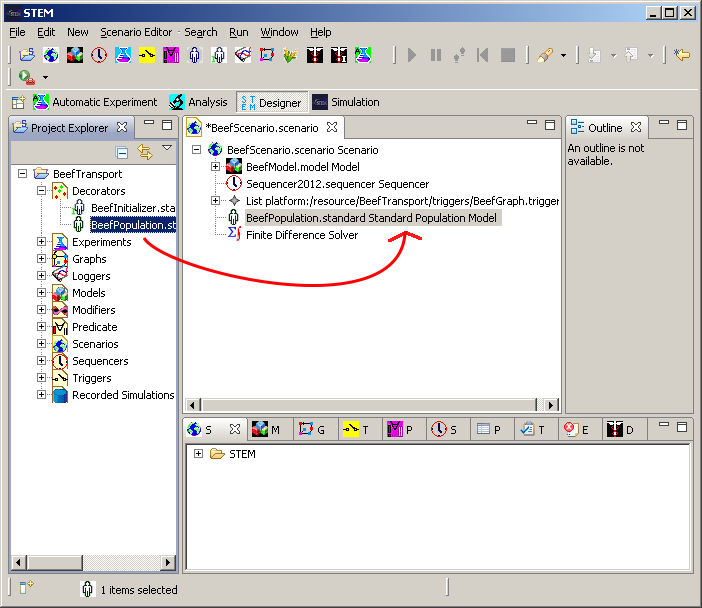 Now we set the Gain Factor in the context menu to 0.001. This factor scales the red coloration of the regions. 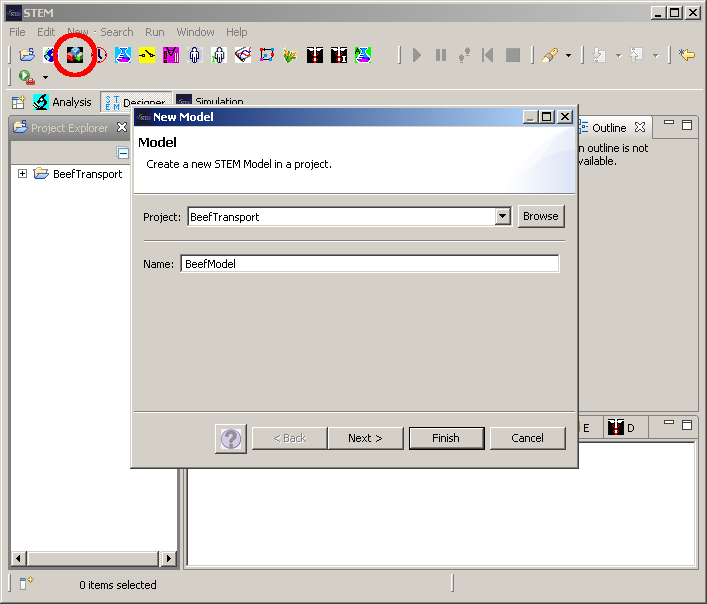 Now you can run the simulation step by step by pressing the step button. This page was last modified 14:38, 17 August 2012 by Judy Douglas. Based on work by Christian Thoens.